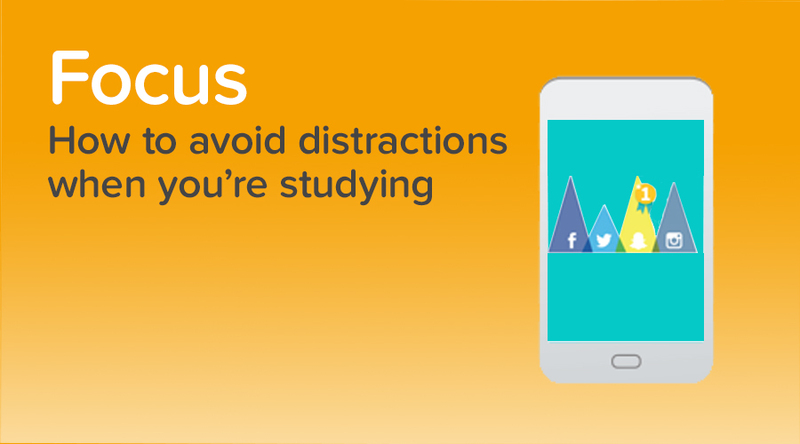 We get asked a lot here on Studyclix for ways to stop getting so distracted when trying to study. There are a few reasons why people get distracted easily but also a lot of solutions. I've put a little blog together to help you get more focused and improve your study tactics. If you don’t use your phone or laptop when you’re studying, remove it from the room! Having your phone or laptop beside you while you’re studying is the number one distraction you’re going to have, especially if you’re getting Snapchat, Facebook and WhatsApp notifications all day long. If you don’t need it, just get rid of it from the room you’re studying in. You’ll be able to focus on the subject/topic better if it’s the only thing in front of you demanding your attention. I know the temptation to look at your phone is hard to resist (trust me, I’ve been there) but it’s a only a short sacrifice you have to make and it’ll be worth it when you get higher marks. For those of you who need your phone as a watch, either put your phone on Airplane Mode while studying or download an app like “Keep Me Out” which locks you out from your phone for a selected period of time, or else something like App Detox, where you can set your phone to ban you from Snapchat, etc. until after 10pm or whatever suits you. If you do need your phone/laptop for studying - no problem. To avoid annoying distractions or notifications on your device, try downloading some apps that block any notifications from other apps while you’re studying. There are quite a few to choose from, for example “AppBlock – Stay Focused” or “ClearLock”. This will allow you to keep using your phone for study but will block all those continuous notifications flooding into your phone all evening. If you’re distracted even without your phone, try listening to some focus music. You can find a lot of concentration and focus playlists on Spotify and YouTube which are designed to focus your brain. It mightn’t work for everybody but it’s worth a try! If the focus music doesn’t work, consider changing your method of study. It’s often easy to get distracted when the study method you’re using is boring and ineffective for you. If you’re finding it hard to focus, try mixing up the way you study, start drawing things out like colourful notes, mind maps or flashcards. If you’re just reading through pages and pages of black and white text then of course you’ll get bored and your mind will wander. Try to keep your study area as clean and distraction-free as possible. This means not having a TV in the room and don’t sit in front of a huge window that lets you look out at people walking past. It also helps to keep your area/desk tidy, because seeing mess, books and paper everywhere will distract your brain, whereas if you’re surrounded by tidiness and order, your brain will be ready to also follow order and be focused. Make sure you know what exactly you’re studying and what you want to achieve. Lots of students get distracted easily because they’re not entirely sure what they should be studying, they just know that they should be studying. Make a clear study plan and make a list of study goals that you want to have at the end of the study session. This will help you be more focused while you’re studying because you’ll know what your target is. 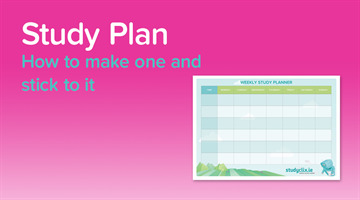 You can download and print off our study plan template here.